Hold a shell up to your ear and you hear the sound of the sea, a sound that tells you maritime stories, conjures up ships, waves, tides coming in laden with seaweed, sea breezes whipping your hair into your eyes. Artists Claire Coté and Anna Keleher make artworks that do something similar but with the sound of the land instead. Their artworks and radio broadcasts invoke ancient and contemporary stories of the land: its undulations, its soils, the layers of rock beneath our feet in a subterranean world usually hidden from view. The artists use the human geography and history of landscapes to speculate about our shared future. 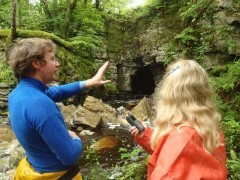 For Radio Dreaming they explored the caves and landscapes of Marble Arch Caves Global Geopark on the island of Ireland, talking with many people, making recordings. Then they toured around this same landscape and its communities with their mobile sculpture, the Place-Dreamer Pod, dreaming and talking with farmers, potholers, historians, scientists, geographers, and re-engaging with the many residents who inspired and generously contributed to the work. ClaireandAnna made six radio programmes broadcast on community radio stations around the world. The programmes focus on edible landscapes, dreams, local traditions and myths, geology, self-sufficiency and off-grid living. The extraordinary Marble Arch Caves system runs beneath Cuilcagh Mountain and the border between Northern Ireland and the Republic of Ireland. The first recorded exploration of these winding caverns with their underground river and slender tangles of glistening rock filigree was undertaken by candlelight by Edouard Martel at the end of the 19th century. The caves however have been there for over 350 million years, their stalactites formed by millennia of rain seeping through and sculpting the porous limestone. In the landscape above this subterranean world, evidence of human presence and burial tombs is at least 4000 years old, and some of those early people must also have explored the caves long before Martel. Above ground is a glacial landscape of limestone pavement, sandstone boulders dumped erratically by the retreating ice, peatland, ash and hazelwoodland. Rock faces rise up vertically with straggling vegetation clinging to ledges and growing from unlikely crevices; freshwater pearl mussels cluster in the river; streams disappear suddenly into swallow holes. Beetles, bugs and butterflies clamber and hover around the pools andspongy hummocks of the bog with its luxuriant, brilliant green mosses. Gamine-faced golden plovers swirl in the sky overhead, their plumage flecked yellow and grey, streaked white. The medium of radio has tremendous reach. You can listen to an online radio broadcast anywhere in the world and thousands of people do, but it also has tremendous intimacy as voices murmur seemingly directly to you, in your living room, your kitchen, your car, your ear. Anywhere on earth you can listen to Margaret Gallagher making a cup of tea in the kitchen of her traditional three-room cottage in Boho, County Fermanagh. The radio programmes cajole us, a gentle mixture of information and imagination. We hear human, animal, mineral, and meteorological cacophonies and whispers, sounds and stories. Wind sweeping across hills and bogs and dripping stalactites mixed with traditional music and voices singing or speaking to us. Water trickles over rock, pummels rock, branches creak rubbing against each other, language – English and Irish – is savoured, corn crakesare remembered. The drone of wind and water wash the mind, send us to sleep with a sodden lullaby. Fiddles, hard rain, tent zips, bodhran, birdsong, food sizzling in a pan, place names, weather forecasts, laughter, bee-loud glades, ukelele, sudden silence. ‘The place is making an artwork for us,’ Claire Coté tells the listener as these sound textures create virtual visuals. The distant voice brought near is important for the artists’ own collaboration since Claire Coté lives in New Mexico, US and Anna Keleher in Devon, UK. They are 4000 miles apart, talking with each other and sharing materials online, through a seven hour time difference. Other distant voices emerge in their work – voices from the past stretching back to the Neolithic inhabitants of this landscape. 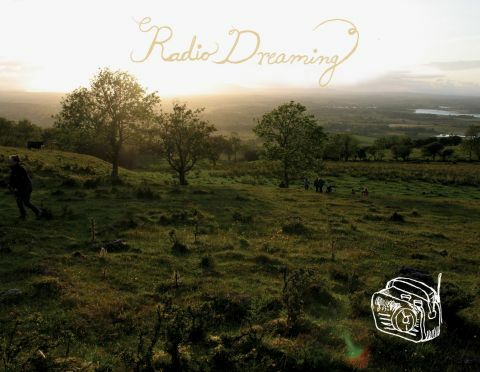 Radio Dreaming telescopes time and distance. The artists are explorers into histories and geographies, into a back-to-basics future of off-grid, self-sufficient living. Food, storytelling, settlements and mobilities are central to their work. They use drawing, audio and crafted artifacts to create engagements with people as they pass through on their expeditions. They converse on the effortful but autonomous and rewarding lifestyles of people living in old stone cottages, living slowly on the road in a horse and waggon, living with the land. ClaireandAnna’s visions of the future are based on examples from the past, rather than on progressive, technological solutions to problems created by the Anthropocene and the time of climate change that we are living in now. Their work asks us to imagine sustaining life from the land and our own labour, to imagine living in a gift giving, exchange culture. They create their artwork from extraordinary gifts of knowledge, memories, skills, and kindness they received from the people they encountered. Their radio dialogues consider ancient and contemporary methods of harvesting energy from the environment – from sun, wind, water, wood; living to the diurnal rhythms of light, dark and warmth. They are particularly interested in how human motion can generate energy: walking, running, pedal power from weaving. They look at archaeological remains in landscapes, imagining the lives of mesolithic people making survival tools from the environment: clay vessels, flint tools, turf fields that might contain bog bodies and bog butter. In a previous artwork on Dartmoor National Park, Devon, in England, their audience struggled through rain, wind and cold, crossed a river on stepping stones, and used a map to discover a wooden box buried in the peat, keeping homemade bread and butter cool – a peatbog larder. The participants in this project by ClaireandAnna had small containers attached to their ankles, churning cream into butter with their gait over a three mile stretch, and then we ate our own walked butter with tea and cake. ‘The primeval trek to pull histories out of the earth was a remarkable event that was multi-sensory but also opened up the imagination to the richness of place,’ wrote Alan Boldon, one of the participants. In Raymond Williams’ novel People of the Black Mountains, set in Wales, the history of the land and its former inhabitants come alive as the narrator treads the mountain paths, and ClaireandAnna’s projects have a similar quality, resurrecting the past in our mind’s eye. The artists explore dreams, daydreams, and the visionary dreams of humans, animals, and of the land itself. 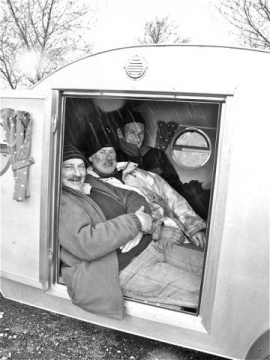 They dream in tents, in vans and in their Place-Dreamer Pod, towed around the Geopark. The Pod is a miniature bedroom, kitchen, larder and dining table. It is a solar-powered listening and recording suite, a collaborative drawing studio, and a way to meet and talk with people who respond to its smallness and comfortable domesticity, its sense of playing at home. ClaireandAnna’s work addresses ecological, economic and ethical issues with wry humour and hopefulness. They evoke the wonder of the world for us in all its minutiae. Memories of the land are a bedtime story before the blanket of the night. Dreams of the future change and reform like clouds over the blanket bog.